The statement seems to belie a basic understanding of inductance, the inductance of a given conductor formed into a single turn loop is not simply perimeter multiplied by some constant “inductance per foot”. Above is a plot of inductance per unit length for a range of round conductors (given in mm) forming a circular STL. The curves are asymptotic to the inductance per unit length of that sized conductor in free space, and at the low end (typical of the geometry of STL) the inductance per unit length varies with loop perimeter (or circumference), and it depends on the conductor diameter. The inference that the inductance of a STL using round conductor is directly proportional to perimeter is wrong. The inference that the helical conductor simply increases the length and that inductance is some notional inductance per unit length of a ‘standard’ conductor times the helix length is not well founded, it is in conflict with well established theory and not supported by credible experimental evidence. The workings at http://www.antennastealth.com/calculate-a-helical-loop.html where a standardised inductance per unit length for 1.5″ diameter copper tube is applied to 3″ wide copper strap and used to calculate the inductance of the strap helix of 175% diameter are based on this approach but credible measurement data to validate the calculations is not offered. This fudge of loop diameter increases radiation resistance by a factor of near 10, yet there is no experimental or theoretical evidence offered for such an increase in radiation resistance. The inventor claims that “Helical loading introduces a larger inductance…” but I have been unable to find any measurements or other quantitative data to demonstrate the extent of any increase in inductance. If the helical conductor was wound on a circular form (a toroidal coil), we could envisage that there was a circumferential component of current that contributes to external magnetic field (including radiation) and radial and axial components that contribute to ‘internal’ magnetic field which does not contribute to radiation. This suggests a higher inductance than a simple circumferential conductor but no increase in the external current moment. 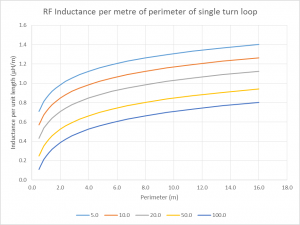 Increasing inductance alone decreases antenna bandwidth which may be a significant disadvantage for small loops that already have very narrow bandwidth. It is relatively easy to measure the inductance of the helical loop. I have not found any claims or measurements of the effect on radiation resistance or loss resistance elements. We might expect some effect on radiation resistance, and small loop assumption of approximately uniform current might be exceeded by a smaller loop perimeter than a more conventional loop. Loss resistance might be significantly higher than for an equivalent tube. The important thing from a radiation efficiency perspective is the ratio of radiation resistance to total resistance. Increasing loss resistance increases bandwidth and decreases efficiency unless there is a compensating increase in radiation resistance. It is relatively easy to measure the total resistance of the helical loop, somewhat more difficult to apportion it to elements such as radiation resistance, structure loss resistance and ground resistance. The calculator assumes a plain round conductor with fully developed skin effect to calculate the inductance of the loop. The violation of those conditions means that its inductance estimate would be wrong for the helical conductor case, though how wrong is unknown as the helical loop designer has not published inductance measurements (though he states it increases inductance). Error in calculated inductance rolls into some but not all results. The calculator assumes free space radiation resistance, and has a factor for adjusting that if the ratio of Rr/Rrfs is known for the scenario. My first thoughts are that the helical conductor has some small effect on l radiation resistance, though I have not seen measurement data to support that view. The inventor makes no claims that I have seen. 80, 60, 40 & 30 Meter Linear Loaded Magnetic Loop, 72.5 inches in diameter mounted 5 ft off the ground. Handels full legal limit 1500 Watts. 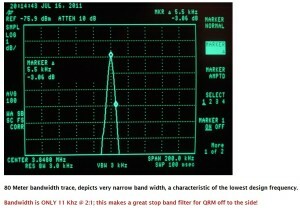 Tunes 1/1 vswr at 50 ohms from 3.0mhz to approx 12 mhz. The Q of this loop is > 1400 at the low end of tuning (75/80 mtr range). The Q is a bit lower in the 40 mter band, around 1000 or so. This reflects the bandwidth to be approx 7 khz on 80 mtrs and around 18 khz on 40 mtrs. Though it says “linear loaded”, it is clearly a helix of wide thin copper tape wound helically around a PVC tube. The author apparently doesn’t know the meaning of the well known term “linear loaded”. The following Photos are the actual Bandwidth characteristics that were measured in the real antenna position by sweeping the antenna. This will give the builder a feel for what to expect out of each band when designing a loop. The test configuration is not described, and the reader is left to try to guess the meaning and validity of the results. We can calculate the antenna Q for the first three cases, it is 350, 700, and 247, none of which come near the earlier claim of 1400. An NEC-4.2 model was constructed of a similar loop with 60mm diameter copper conductor, a tuning cap with Q=5000, and centre at a height of 3m above ‘average ground’ at 3.85MHz. 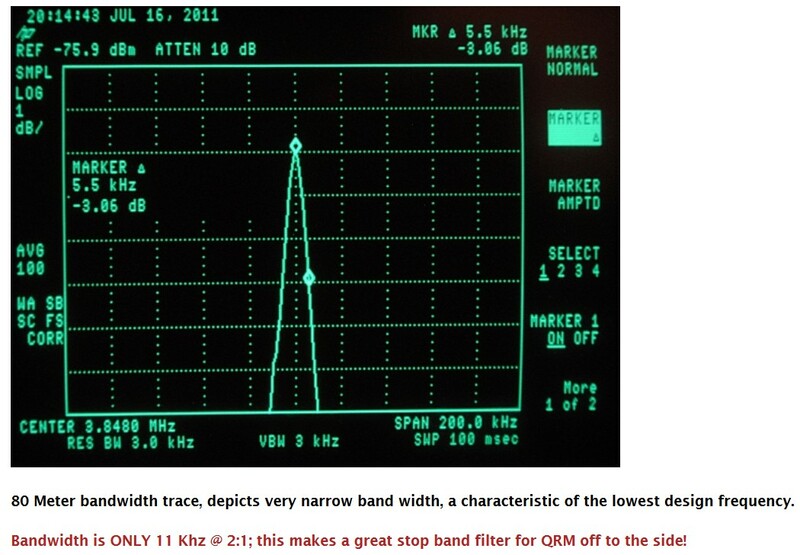 The calculated Q was 2200, giving a half power bandwidth of 3850/2200=1.75kHz. The higher Q is probably mainly due to lower loss resistance as radiation resistance and ground resistance are probably very similar, and inductance is probably not much higher than for the plain conductor. Efficiency was 12.6%. 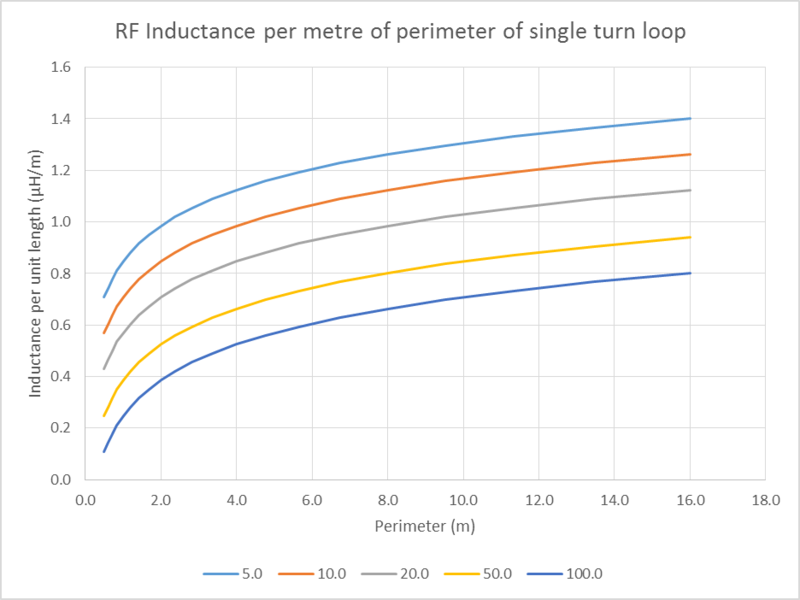 This loop is much narrower notwithstanding K8NDS’s claims of increased inductance for his loop, and therefore probably much more efficient than K8NDS’s similarly sized helical loop. The K8NDS helical loop is probably not a novel idea and there is a dearth of clear and reliable actual measurement data to characterise it, or to demonstrate that it meets its claims. The little data that is available is not confidence inspiring. The claims made are inconsistent with the theoretical analysis of (Maclean 1978). The inductance of the helical loop, radiation resistance, ground resistance and structural loss are key elements of design and quantifying them is essential to understanding the antenna behaviour and performance. Calculate small transmitting loop gain from bandwidth measurement depends on some assumptions that are inconsistent with K8NDS’s claims / explanations, whether or not they are supported, and the calculator is not appropriate to that problem at this time. K8NDS. nd. http://www.qrz.com/db/K8NDS (accessed 19/09/2015). Fusinski, R (K8NDS). nd. Stealth Antennas for the Radio Amateur http://www.antennastealth.com/(accessed 20/09/2015). Fusinski, R (K8NDS). nd. Helically loaded magnetic loop antenna http://www.hlmagneticloopantennas.com/ (accessed 20/09/2015). Maclean, T. Apr 1978. Small toroidal antennas. In Electronic letters 25 May 1978 Vol 14 No 11 p339.